Precious Heartdwellers, Ezekiel just had a warning dream that I want to get out to you right away. I was right on the heels of the first message that I did. And, this is what it was. Two little children were dressed to go somewhere, a little boy and a little girl. They were going to be going out. 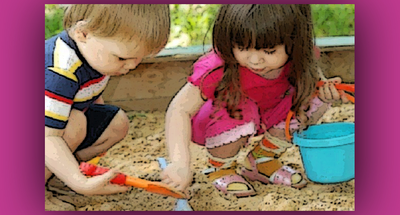 And they were sitting in the sandbox and playing with a spoon and a little shovel and little bucket. Caught up in their playing in this sand. All of a sudden, a man that looked exactly like God the Father, with beautiful silver hair and a silver beard, came walking around the corner. And the children, when they saw Him, they realized 'Oh my gosh, we're supposed to be ready to go and we're not ready!' This pain shot through their heart like a javelin, right through their hearts. He was not being menacing or intimidating, but there was this POWER coming forth from His heart, like a javelin. And it went right through their hearts when they realized, 'Oh, we were supposed to be ready!" And then he woke up from the dream. And it couldn't have possibly been more than two minutes after I had finished recording the previous message. And in the dream, the javelin went right through his heart, and it hit him physically. He could feel it in his chest, so hard, that he couldn't get out of bed for 15 minutes. When I saw the look on his face, I said, "Honey, are you okay??" He told me about this dream that he'd had, right on the heels of the last message. Ezekiel believes that it was a warning dream for us, not to be slack in prayer. The Lord asked us to pray for the country. Our prayers really, really matter. They're very powerful. Don't be distracted by your life and your circumstances. Stay in prayer for our nation and BE READY. Be ready! Don't be playing around. BE READY. That is so important to Him. He needs our prayers and He needs us to be ready. None of us, really, has any idea of what this event is going to be like. It is going to be overwhelming and petrifying at the same time. It's going to be something so powerful and so incredible that it's gonna literally knock us off our feet. And if we're not ready and we've forgotten the urgency of the hour, and the warnings the Lord is given us. And we're sitting there in our little sandbox with our shovels and our spoons and our buckets, just playing? It's going to be really BAD for us. The Lord needs our prayers and we're not ready. It's gonna be really, really bad. And the Lord is warning us - "Don't put this off. Be ready! Now!" So, please - I've taken this to heart and I'm definitely going to check my behavior and the way I'm using my time. And I pray that you will take this to heart, too.